Summer is here! (apparently!). But for pasty girls even the hottest of heatwaves can leave a chill in the air when they remember that wearing a dress means they'll have to put their lily-white pins on display. 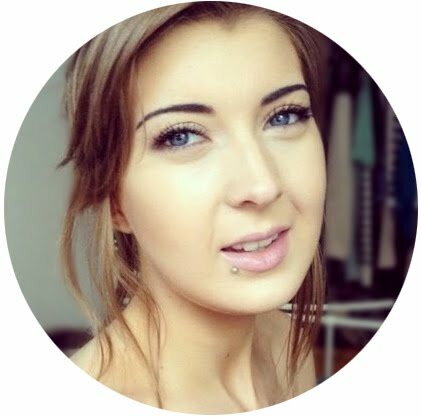 Having tried everything from self tan oil to gradual tan, the thought of baring my skin doesn't bring me out in a (heat) rash, and I've got some tips to make you look bronzed and lovely without having to crisp up your delicate skin in the sun. Everyone knows they should exfoliate more than they do, but it really is key before applying self tan. A product like Whitetobrown Exfoliate* £7.99 is great for this as it has a gel formula which doesn't leave an oily residue on the skin. The exfoliating particles are small and scrubby but you do need to get your palms in there on tough areas like ankles and knees. After exfoliating to get rid of dead skin cells and any previous tan you had on, applying a moisturiser will ensure that the self tan develops evenly and doesn't stick to dry areas. The St Tropez Tan Optimiser* £5.95 contains Apricot Oil, Shea Butter, Aloe Vera and Jojoba Oil which make sure that skin is moisturised, particularly on the knees, elbows, hands and feet. St Tropez also say the Tan Optimiser can be used on holiday to prolong a tan (I've yet to try this out!). Once you're smooth and prepared, it's time to self tan. 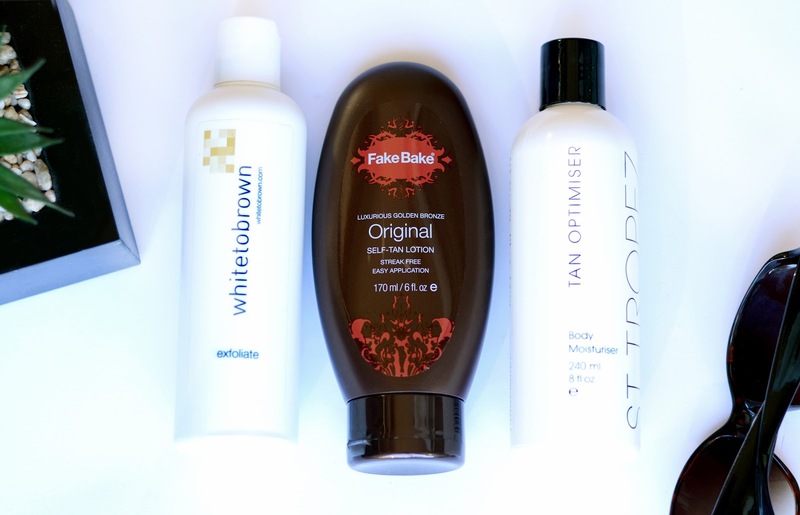 I was sent the Fake Bake Original Self Tan Lotion £12.50 to try out, which is one I haven't used before, but the brand has been around since I first started tanning. The lotion comes enclosed with a pair of blue gloves, but I find that all tans apply best and fastest with a mitt so it's definitely worth getting your hands on one. The lotion is a dark brown colour which smells to me a bit like lychee, and it smooths in easily to create an even layer. After leaving the product on overnight, you're left with a medium tan that's not orange and definitely a better colour than you'd get from a day in the English sun. You can reapply the tan the next night for a darker colour or use an oil-free moisturiser to make sure it fades evenly. 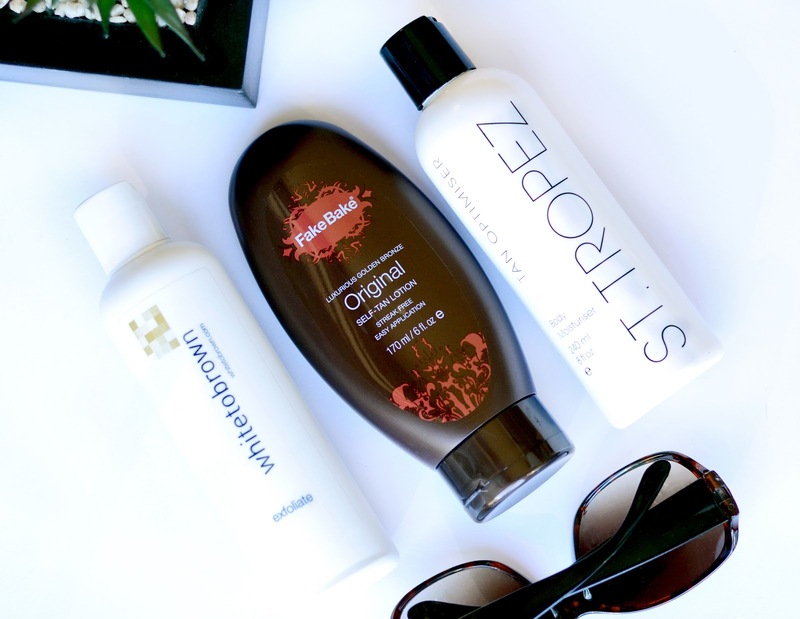 Self tanning can add a bit of extra time to your routine, but it means you'll be a nice sun kissed shade, even if you haven't faced the sun for a while!